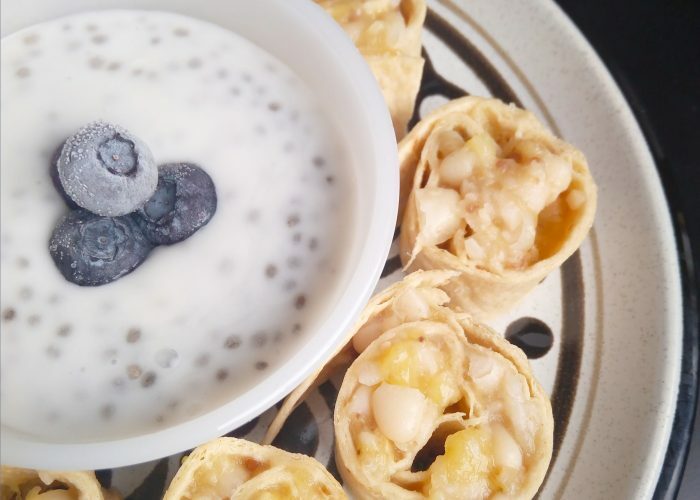 You can serve these Banana Bliss Bites as is, or pair it with other breakfast items like fresh fruit and a glass of fortified plant-based milk for a more nourishing meal. Another idea is to serve it alongside a thick chia pudding topped with blueberries (as pictured). No time to cut up the rolled up tortilla? Just stick the whole roll in a re-usable container or resealable plastic bag to bring and eat on your way to school or to work. Banana Bliss Bites is a plant-powered meal idea that also works well for a snack or lunch option for home, school or work! A sweet protein-rich snack or power lunch option when you need to get on the go that’s dairy-free, egg-free, nut-free, oil-free and gluten-free (if gluten-free tortilla wraps are used). Warm a tortilla in a large saucepan or skillet on a low heat setting. If using canned beans, drain and rinse the white navy beans well. Place the beans in a colander to remove any excess water from the beans before using. Using a fork (or potato masher), mash the measured amount of cooked or canned white navy beans with the ripe bananas until well mixed together. Remove the warmed tortilla from the skillet and place it onto a large plate. Spread on a quarter of the creamy mashed banana-bean mixture. Sprinkle on 1 ½ teaspoons of ground flaxseed, then roll up the tortilla tightly like a carpet, before slicing into bite-sized chunks. Repeat this process with the other tortilla wraps. Ready to devour! Skip the tortilla wrap warming part if you are rushed for time. You can also just eat this as a whole roll instead of slicing the roll up into bite-sized pieces. Feel free to add other seasonings into the tortilla wraps before rolling it up (examples are a dash of cinnamon, nutmeg or other spices)! If packing for a school or work lunch, it is best to make these Banana Bliss Bites in the morning instead of the night before. This prevents the tortilla wraps from getting too moist and soft from the filling overnight.